What Items Do I Need to Bring When Going to See My Tax Preparer? What Papers Do I Need for a Tax Return? Your tax preparer can help you file correctly and take all the deductions and credits you are entitled to, but only if you provide the correct documentation. To get the best quality help from your tax preparer, schedule an appointment well before April 15, show up on time and organize your paperwork. Your tax preparer will need the names and Social Security numbers of you and your spouse, as well as any dependents, including children who were born before the end of the tax year. Your tax preparer may need to see each person's Social Security card and picture identification. Bring W-2s from each employer you had over the past tax year. If you are self-employed or an independent contractor, bring 1099-MISC documents from your clients, in addition accounts receivable records that record income from customers who did not issue you a 1099. If you are married, filing jointly, bring those of your spouse, as well. Each January, your broker should issue you any documents you need to report various types of investment income. Records may include Form 1099-INT for interest income, Form 1099-DIV for income from dividends, Form 1099-B for stock sales and Schedule(s) K-1 for investment in a partnership or S corporation. If you have foreign investments, bring broker statements that record these. What Types of Things Can I File on My Taxes? 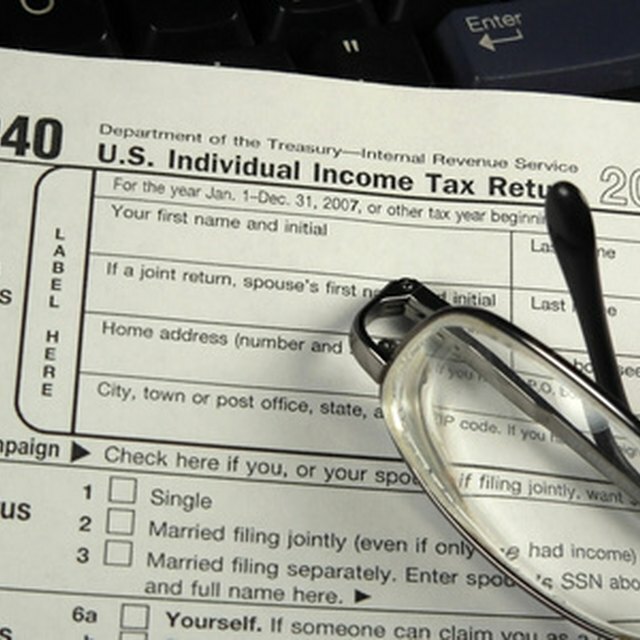 How Long Do I Have to Save My Personal & Business Tax Returns? If you received a state or local tax refund during the previous tax year, bring your tax preparer the 1099-G that records the payment. You will also have a 1099-G if you received unemployment income. Social Security income is reported on Form SSA-1099. If you have income that is not listed here, see IRS Tax Topic 400 for a complete list of income types and how to report them. If you are self-employed, you can claim a deduction if you operate a business out of a home office. Your preparer will need to know the square footage of your home, the square footage of your office, the mortgage interest you paid on your home if you own it, how much rent you paid if you are a tenant, what you paid in property taxes, and how much you spent on utilities, repairs and maintenance. If applicable, you should also come to your preparer armed with inventory records, invoices and receipts that show you purchased equipment or machinery, and vehicle mileage records you racked up while traveling for business, among other things. If you are employed, bring receipts for anything you purchased, including uniforms, for work. For more information, see IRS Publication 525, Deducting Business Expenses. If you paid for something during the previous tax year that you think you can take a tax write-off for, bring proof. You can deduct all or part of expenses relating to: interest you paid on a mortgage, health insurance premiums for your children, health care expenses, child care, college education and job training expenses, and donations you made to your church or another nonprofit institution. If you contributed to a traditional, Roth, SIMPLE or SEP individual retirement account, you must report it on your tax return. Bring a statement from your IRA custodian. If you want the IRS to directly deposit your refund into your bank account, bring your preparer a canceled check so she can record your account and bank routing number. Diane Kuriluk has been writing about small business solutions, economics and personal finance since 2007 for sites that include Work.com. She is also a professional grant writer for nonprofit organizations. She attended the University of Michigan.